Get ready for another awesome year of gaming with this ultimate guide to the best games, including a definitive list of the biggest games of the past year and the new ones coming in 2019. Featuring Five Nights at Freddy's and Hello Neighbor!Game On! 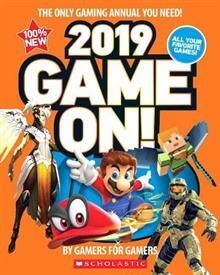 2019, the most comprehensive guide to all the best games, tech, and YouTube stars, features some of the year's greatest moments, including exclusive interviews with YouTube legends, top streamers, and game developers.This complete guide is packed with information on all the latest gaming hardware, tech, and essential mobile games. Also included are the best gaming secrets, stats, tips, and tricks to help unlock achievements and trophies on games like Marvel Vs. Capcom: Infinite, Spider-Man, GT Sport, Sea of Thieves, and so much more! All games featured in Game On! 2019 are rated T for Teen or younger, keeping it appropriate for young gamers.